You can not only pass underneath the bridge, you can climb it, walk over it and visit their Museum. You can even hike over the top! 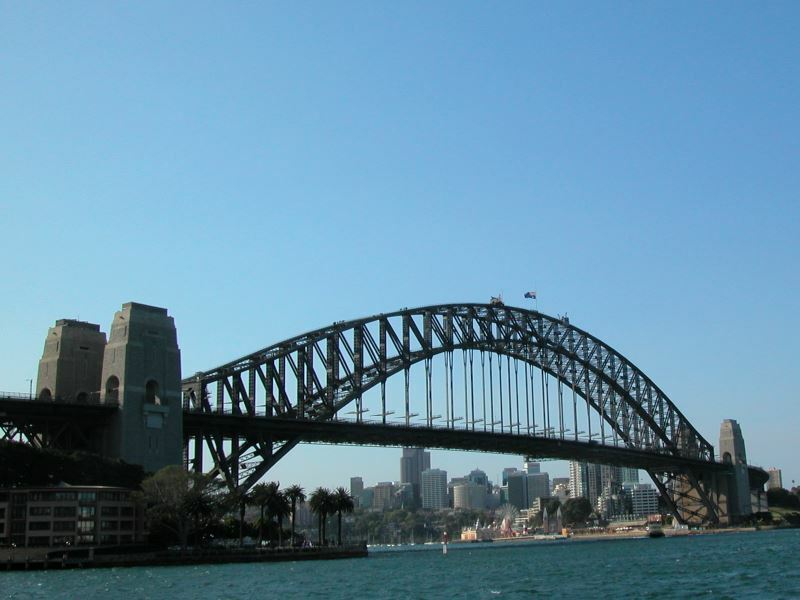 Now known around the world for its part in the Sydney New Years Eve celebrations with its spectacular fireworks displays, the bridge was completed for use in 1932. Using 6 million rivets, 52,800 tonnes of steel and 272,000 litres of paint, it has served Sydneysiders and visitors for almost a century. Sydney Harbour has the official name of Port Jackson, given to it by Lieutenant James Cook in 1770, on his earlier voyage to Australia. Naming the inlet after Sir George Jackson, he never sailed into it to realise its full potential as a beautiful but very extremely useful harbour. He did note however in his journal that it appeared to be good anchorage. Sir George Jackson, who served as the second Admiralty Secretary and Judge Advocate, was a close friend of Cook and was his early patron. Cook also named another port in New Zealand with the same name. In Sydney, Port Jackson stretches from the headlands between Manly’ North Head and the Eastern suburb’s South Head for some 20km inland, to join at the mouth of Parramatta River. Covering an area of some fifty five sq. kms., it has a shoreline of 240 kilometres while holding some 503,786 megalitres of water. Combined with its sister harbour of Botany Bay, located just south, it handles Australia’s some thirty million tonnes of cargo every year.